Believe it or not, there are researchers who have assessed this and the findings are not too good if you are a poker player. As of 2015, the average human being can stay on task without distraction for 8.25 seconds, while the average goldfish has an attention span of 9 seconds! That’s over a 30% drop in just 15 years! Researchers attribute this drop to changes in external stimulation – that is we are constantly bombarded with highly stimulating images and content from the internet, our phones, twitter, and a host of other sources. 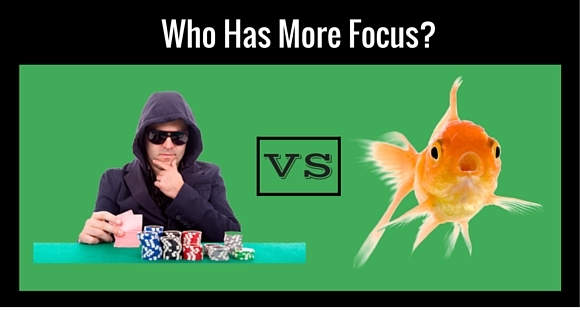 Attention span is measured in these studies as the amount of concentrated time a person (or a goldfish) can stay on a task without becoming distracted. Being able to avoid distraction and stay on task is important because it is the only way one can reasonably expect to reach one’s goals. There strategies that you can implement that have been shown to improve brain function and increase attention span. Here are 5 of the simplest strategies that you can start using right away. When we interviewed Patrick “pads1161” Leonard on the Mindset Advantage podcast (listen to the episode here) he talked at length about how distracted he often was while playing. To temper his urges to check email, chat on Skype, and poke around Twitter or Facebook, he completely removed those applications from his computer. You can also put your phone on airplane mode and refuse to respond to anything that attempts to steal your focus. The human mind is notoriously poor at multi-tasking and removing temptation is often the easiest solution. In a recent study, Harvard researchers found that regular exercise improves memory and concentration. You don’t have to turn into a complete gym rat, but getting your blood pumping for a half hour a day provides measurable benefits. The Pomodoro Technique is a strategy for focusing intently on one task for a short amount of time. Spend that time giving the task your full focus. You’ll notice that MTT breaks match up with this technique well, but sadly online MTT players won’t be able to do step 5. If you don’t know where you want to go, it’s incredibly hard to focus and put in maximum effort. Take some time and write out what you’d like to achieve in the next 30 days. Break down the steps that you will need to complete to reach your achievement. Dedicate time each day to focus on the steps. Bonus points if you use the Pomodoro technique described above to complete the steps! There is a difference between how your brain works reading digitally and reading a physical book. With digital items, we tend to skim rapidly. Holding a book in your hand and reading it trains your brain to focus for an extended amount of time. If you are used to only reading digitally, a physical book may take some getting used to, but stick with it – the results will be worth it. These are just a few of the techniques that you can use to increase the amount of time that you are able to focus and maintain total concentration. Give them a try and maybe one day soon you’ll be able to give that goldfish a run for their money! This article first appeared on www.pokermindcoach.com.